Dogs could be trained to sniff out malaria in people according to new research aimed at preventing the spread of the deadly disease. Researchers found that dogs could scent malaria in samples of socks worn by infected children. They say their findings could potentially lead to the first rapid and non-invasive test for malaria. Although the research is in its early stages, the scientists hope trained sniffer dogs could help to stop malaria spreading between countries and lead to infected people being spotted earlier and treated quickly. The research is being presented today (Monday, 29 October 2018) at the American Society of Tropical Medicine and Hygiene Annual Meeting in New Orleans, USA. Principal Investigator Professor Steve Lindsay, in the Department of Biosciences, Durham University, UK, said: "While our findings are at an early stage, in principle we have shown that dogs could be trained to detect malaria infected people by their odour with a credible degree of accuracy. "This could provide a non-invasive way of screening for the disease at ports of entry in a similar way to how sniffer dogs are routinely used to detect fruit and vegetables or drugs at airports. "This could help prevent the spread of malaria to countries that have been declared malaria free and also ensure that people, many of whom might be unaware that they are infected with the malaria parasite, receive antimalarial drug treatment for the disease." The research was funded by the Bill & Melinda Gates Foundation. It was carried out by Durham University, the charity Medical Detection Dogs, the London School of Hygiene & Tropical Medicine (LSHTM) and the University of Dundee (all UK), the Medical Research Council Unit The Gambia at the London School of Hygiene & Tropical Medicine, and the National Malaria Control Programme, The Gambia. Researchers from the MRCG and the LSHTM used nylon socks to collect foot odour samples from apparently healthy children aged five to 14 in the Upper River Region of The Gambia in West Africa. Using a simple finger-prick test the children were also screened to determine if they had the malaria parasite Plasmodium falciparum in their blood. The sock samples were transported to the Medical Detection Dogs charity in Milton Keynes, UK where two dogs, a Labrador-Golden Retriever cross called Lexi and a Labrador called Sally, were trained to distinguish between the scent of children infected with malaria parasites and those who were uninfected. In total 175 sock samples were tested including those of all 30 malaria-positive children identified by the study and 145 from uninfected children. The dogs were able to correctly identify 70 per cent of the malaria-infected samples. The dogs were also able to correctly identify 90 per cent of the samples without malaria parasites. Malaria is a life-threatening disease caused by parasites transmitted to people through the bites of infected female Anopheles mosquitoes, but it can be prevented and cured. According to the World Health Organization (WHO), since 2000 six countries have been certified malaria free, with another 12 countries reporting that no malaria cases have originated within their borders. Despite this success, however, progress in global malaria control has stalled. According to the WHO's latest World Malaria Report, there were an estimated 216 million cases of malaria in 2016, an increase of five million cases over the previous year. Deaths stood at approximately 445,000, a similar number to the previous year. Identifying people infected with the malaria parasite, but not presenting symptoms, is critical as they can be treated with antimalarial drugs and the spread of the disease can be prevented. Sniffer dogs could provide a non-invasive, portable and rapid test for identifying malaria carriers and would be particularly useful in settings where there are few individuals with malaria parasites. Confirmation of the disease would then be made by taking a finger-prick sample of blood using a rapid diagnostic test following World Health Organization guidelines. An accompanying study introduced a fake biodetection dog to Gambian villages to gauge their acceptability, with researchers reporting that most people were favourably disposed to their use in principle. 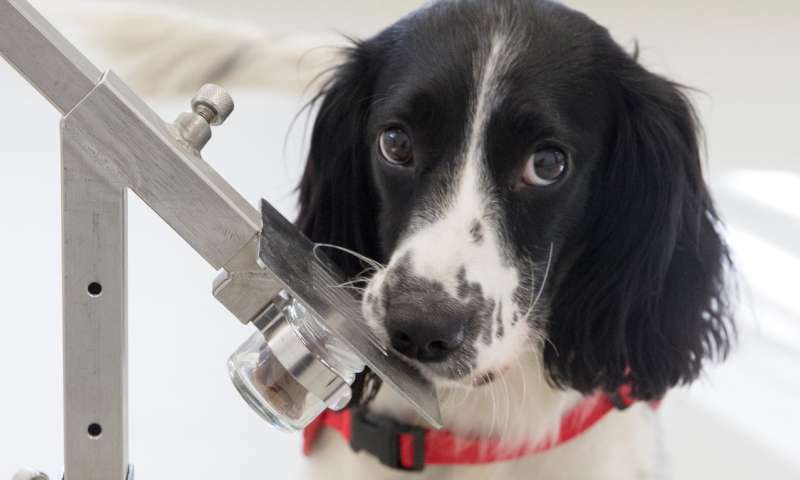 Since the initial study a third dog, a Springer Spaniel called Freya, has also been trained to detect malaria. Study co-author Dr. Claire Guest, Chief Executive Officer of Medical Detection Dogs, said: "MDD have had positive results training dogs to detect diseases including cancer and diabetes sugar changes by odour. This is the first time we have trained dogs to detect a parasite infection and we are delighted by these early results. "The possible potential to train dogs to detect tropical disease where diagnostics are poor, such as leishmaniasis and trypanosomiasis is huge. I believe that this study indicates that dogs have an excellent ability to detect malaria and if presented within an individual infected with the parasite or a piece of recently worn clothing, their accuracy levels will be extremely high. This is a reliable, non-invasive test and is extremely exciting for the future." Surveys of schoolchildren were undertaken by the Medical Research Council Unit The Gambia and ARCTEC at LSHTM. Sock samples were processed before being sent to Medical Detection Dogs. Co-author Professor James Logan, Head of the Department of Disease Control, at the London School of Hygiene & Tropical Medicine, said: "Worryingly, our progress on the control of malaria has stalled in recent years, so we desperately need innovative new tools to help in the fight against malaria. 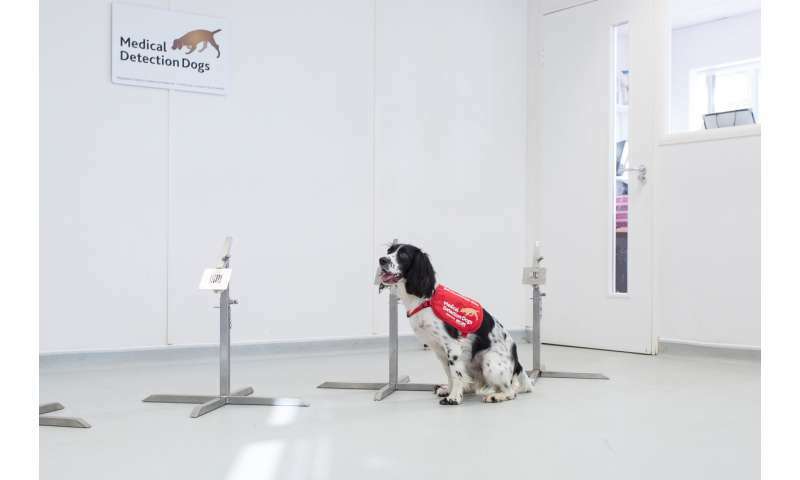 "Our results show that sniffer dogs could be a serious way of making diagnosis of people who don't show any symptoms, but are still infectious, quicker and easier." Co-author Professor Umberto D'Alessandro, Unit Director at the MRCG at LSHTM, said: "Detecting malaria-infected but otherwise healthy people is a laborious and time-consuming process that requires collecting a blood sample to be then processed in a well-equipped laboratory. "New approaches to facilitate the identification of infected individuals to be treated would help enormously in addressing the human reservoir of infection and possibly reduce malaria transmission. The opportunity to use trained dogs for this purpose is promising. Results show that it may be possible to identify infected people by their body odour." The results of the study are broadly in line with the criteria for procurement of rapid diagnostic tests. The researchers say that in future artificial odour sensors might be developed to detect malaria parasites, but until then trained dogs could be a useful alternative at ports of entry. However, they say that further research is needed to see if dogs can directly sniff out malaria in people infected with the disease. Future studies are also needed to see if dogs can detect malaria in the odour of infected people from other parts of the world before the animals could be used in the field, the researchers added.